In a time when the necessity and urgency of certain books feels more apparent and vital than ever, it's imperative to know the ground we are literally standing upon - its past, its real past, what has led to these present moments, the state of this time. 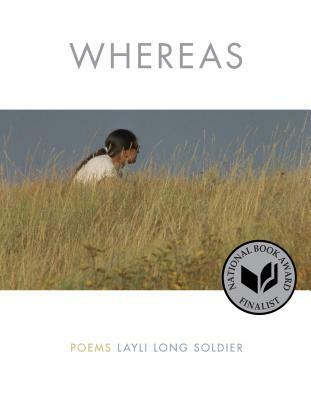 I know of few single books that have invoked this ground as brilliantly, beautifully, and fiercely as Layli Long Soldier does in Whereas. This is not a book, a debut coming from nowhere. Rather, it comes out of place and life, of others preceding, stands with other strong voices in its time, and calls out. Its call is utterly powerful. The day a copy came in the mail, I was on a night flight across the country, west to east. Reading these words, I felt the plane suddenly drawn down to the ground, down to be amidst those there at Standing Rock, putting body, belief, and voice on the line for dignity and justice. Whereas does so as other books do, but poetically, profoundly, and tellingly as few others have. The 'grassesgrassesgrasses.' Yes yes yes.